So much ado about the vaxx or anti-vaxx movements these last few days. I'm more amazed on who weighs in, then on who does not. This of course, means folks from Congress or state governments. Chris "Stapled My Stomach and I'm Still a Sow" Christie advocated for the anti-vaxxers than back-pedaled immediately. Or his office did. He hasn't seen a bike pedal since he was a pre-teen - and then it was just to ride to the DQ. Rand Paul - he without his M.D. or even a D.O. - saying that getting vaccinated gives you mental disorders. I do love how these folks cherry pick the "science" in which they'll believe. 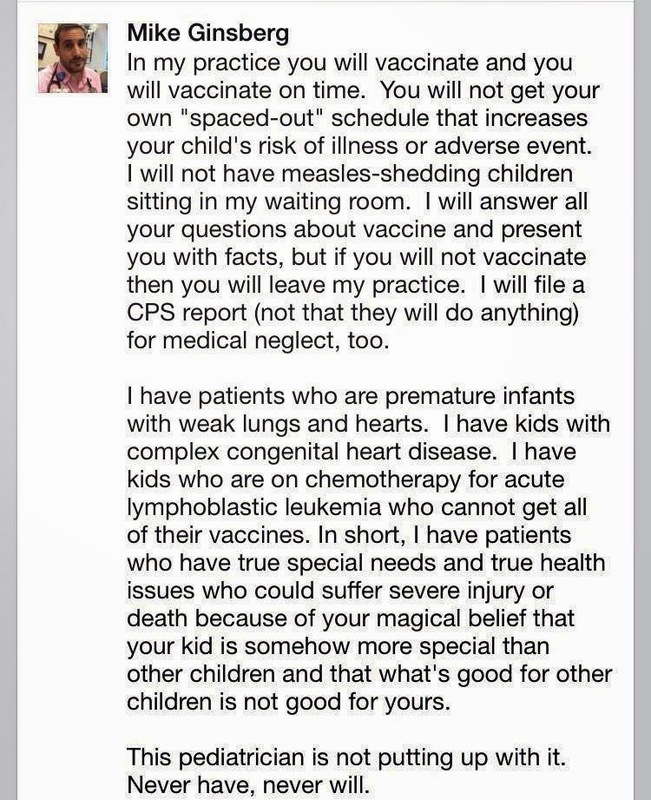 And every 16th comment on-line is based on Jenny McCarthy and her anti-vaccination stance regarding her child's autism, which now she (or her docs?) don't think is actually autism at all. Ooops. Never mind the doctor that she cited with all this 4-1-1 was not only discredited, but had his medical license yanked for life. So......you know.....consider that. Oh, and she smoke e-cigs, which have TONS of chemicals.....so McCarthy might not be the one to go to for medical diagnostics. These anti-vaxx parents don't know what it's like to have to hold their child in a bath of ice water, as the kid struggles and cries, because their fever is so high. 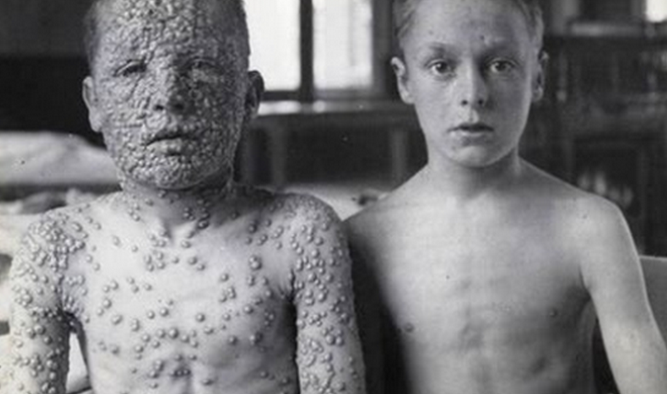 The reason they don't know what it is like is because their own parents had them vaccinated - and I'd say they turned out all right. Though maybe Rand Paul has point. The anti-vaxx parents were most likely vaccinated themselves, but their now on-set mental disorder is keeping them from doing the same to their own kids. All I can say is, if another non-vaccinated child infected their own non-vaccinated child, they'd be petitioning the school boards, health organizations, etc to keep those kids away from everyone else. It's ok for them - just not for anyone else. Yes, guess what - vaccinations are big pharma. BFD. And you know why? Because there were widespread diseases that dictated that solutions and cures be found to eradicate them. Because parents got tired of watching their kids get diseased and die. And you know what? Yes, these medications are made with - gasp - chemicals. Just like everything else you put in your kids bodies that you buy at Safeway. You might want to read the ingredient label on that Gogurt you're giving them. Hmmmmmm.........tricalcium phosphate, potassium sorbate, red #40, vitamin A acetate, blue #1. Thanks Union Carbide! You do a body good! So don't be so high and mighty with your healthcare. And of course, vaccines are not 100% safe or effective. Nothing is. Ever. Get over that too. But if you don't want your kid vaccinated, you better stay away from common areas where you could infect others - schools, playgrounds, Disneyland! Feel free to stupid with your kid, but why should you be allowed to be stupid with others? Oh, and find a doc who is anti-vaxx too. I hope more pediatricians take on the stance of one Dr. Michael Ginsberg. All I can say if HIV was transmitted the way the measles and mumps are, there wouldn't be an anti-vaxxer alive who wouldn't call for quarantine of anyone with it. I mean, just look at how people treat people who come into contact with Ebola treated. How many anti-vaxxers were on the side of the nurse from ME who went out bike riding when she was supposed to be indoors at all times? You nailed it! I don't get why a parent would put their kids at risk. Then again I don't understand why some of my peers carelessly put themselves at risk for HIV. I guess the anti vaxxers haven't watched a sibling die as some of my younger peers didn't bury more than half of their friends and lovers back in the 1980s. Anyone who trusts a word that comes out of Jenny McCarthy's piehole is dumber than, well, Jenny McCarthy. As for Rand Paul, if, as he says, "getting vaccinated gives you mental disorders" he must have been vaccinated every day for the first five years of his life. And I won't listen to Christie until he stes down the crate of donuts!. But the up-side is, it slows the stem of idiocracy. If everyone else is getting their vaccines, and the crotchftuit of the stupid aren't, seems like a great way to keep the IQ at least a little steady for a bit. In theory, of course. I think a watchdog group should publicly come out against these non-scientists and non-doctors after each of these foolish statements about refusing vaccines. Call them out as the ill-informed NON-professionals they are!! Alas, I see it all too often how patients cherry pick what they want to believe to support the convictions rather than be open to science to go towards wisdom and truth. If you want to do the best for your kids then get them vaccinated. Vaccines are safe and effective (although not always 100% as mentioned here and nothing is ever) but they are only given to kids after a long and careful review by scientists, doctors and healthcare professionals. So continue vaccinating your kids completely so in the future we may be able to trust that some diseases of today will no longer be around to harm our kids in the future.